It is always a much welcome sight for sore eyes whenever we see familiar faces in our tropical garden. These garden critters come and go. But when one had been missing in action for months or years on end, and suddenly decides to reappear without warning, it’s truly a great joy indeed! One recent happening was around mid-January when an Oleander Hawk-moth sprung a long-awaited surprise visit to our courtyard garden. 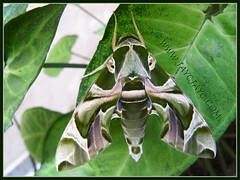 The first appearance of Oleander Hawk-moth to our garden was more than 4 years ago as chronicled in my earlier post dated December 18, 2008. Something in our courtyard caught my attention that bright January morning as I descended the stairs after a good night’s sleep. Check it out pronto, I told myself… definitely weird that a clump of whitish roots would grow on the leaf blade! As I approached the sliding glass-door separating our dining hall and the courtyard, that something on one of Synogium podophyllum’s leaves looked familiar. As I drew closer to gawk at it, I recognized it to be the Oleander Hawk-moth (Daphis nerii), as its remarkable and striking beauty still lingers in my memory though last seen many moons ago. I gazed at it with wonder and astonishment. Not only had it ingeniously chosen the most appropriate variegated plant among the others to camouflage itself, but manage to dive and maneuver its way inside our courtyard which has a plastic netting overhead, covering 90% of the opening above. Amazing!! I’m thrilled to have captured many shots. A great subject for photography as it spread out motionless and was as still as a log for the whole day. I did wonder whether it was blind as a bat in the day and wide-eyed as an owl at night? 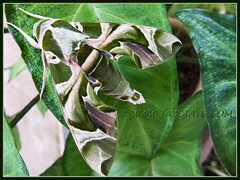 By dusk, the beautifully patterned Oleander Hawk-moth was still around, yet out of sight the next morning, except for traces of whitish liquid on the leaf blade. What a glorious day to be visited by one of God’s awesome creatures! How blessed to be able to admire it close-up! Greetings Jackeline … I hope you received a happy new year full of prosperity snake. 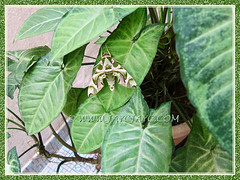 Your plants beautiful as always, let alone the visitor … The moth is showing very beautiful colors on its wings, thanks for sharing. Yara fondly. Cheers, Yara! Hehe… no snakes but started the CNY with lots of fun, laughter and joy indulging in glorious food with family, relatives and friends. Thanks for visiting and sharing your kind thoughts. Enjoy your Sunday and have a great week ahead.